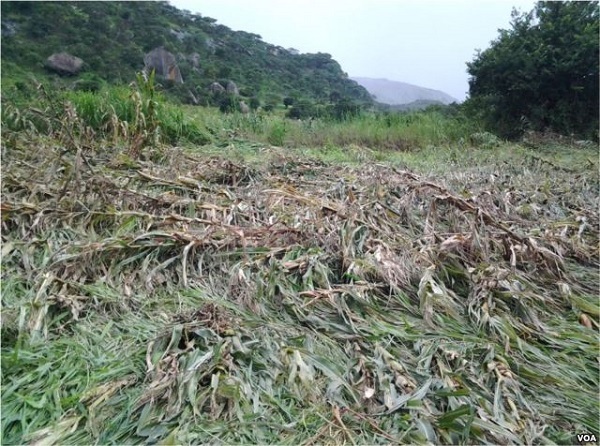 ZIMBABWE – HARARE –Climate change is posing a serious threat to food security in Zimbabwe with the country now experiencing regular droughts owing to increased temperatures and reduced rainfall over the years. But the cash-strapped government says it is doing something about trying to mitigate the effects of climate change. According to the Environment, Water and Climate ministry, the country’s annual mean surface temperature has warmed by about 0.4 degrees Celsius from 1900 to 2000. The country is now experiencing more hot and fewer cold days as a result of climate change and variability while the timing and amount of rain received are becoming uncertain. Droughts are more regular, food shortages are a perennial feature and resulting in a high prevalence of undernourishment estimated at 30 to 54 percent between 2006 and 2012. The trend is worrying, not only for the government but for the ordinary people as well. Recently the government set-up a climate change management department in the environment ministry to deal with climate change management issues in the country. Principal climate change researcher in the Climate Change Department, Elisha Moyo, says the department is already implementing a National Climate Change Response Strategy launched a fortnight ago. The strategy, he says, will guide the integration of climate change issues into national development and addressing its impact on communities. Moyo says what is pleasing is that Zimbabweans are aware of climate change and its effects but there is need for more public awareness among communities. He adds, the department is already implementing adaptation strategies such as raising funds for irrigation supported agriculture. The government is preparing to go to the crucial Paris Climate Change conference (COP21), but permanent secretary Prince Mupazviriwo of the Environment, Water and Climate ministry Zimbabwe’s position will be enunciated by President Robert Mugabe as the chair of the African Union at the meeting. This, he says, follows a meeting convened by the United Nations Economic Commission for Africa (UNECA) last week in Victoria Falls, bringing together African governments and experts to come with a united position ahead of COP21. “Last week Thursday and Friday Zimbabwe had a successful successful stakeholder conference where we were looking at these issues and where we also launched our climate change response strategy. City resident, Henry Mungangatire, welcomes the government’s attempts to mitigate climate change effects but adds more action is required in the worst affected communities. He says, “What we are not seeing enough of on the ground is the actual enforcement of practical things that are affecting climate change in Zimbabwe. One of course is land use, land use is very important because if we don’t farm correctly what ends up happening is we weaken our soils, if our soils are weakened, we weaken our vegetation and that causes siltation in our rivers and water and other issues become a problem. Another resident, James Phiri, says individuals and companies must complement government efforts to reduce the emission of greenhouse gasses, which are largely responsible for climate change. Munangatire and Phiri say they hope Zimbabwe will learn a lot about managing climate change at forthcoming Paris Climate Change conference COP21. Moyo says Harare is ready for COP21 and is optimistic a legally-binding climate agreement aimed at reducing global warming by below 2°C would be reached with the most developed countries, that are largely responsible for polluting the environment, committing more resources towards mitigating the effects of climate change. But Panganayi Sithole of the Zimbabwe Energy Council says the inter-sectoral consultations on the Zimbabwe’s position on the Paris meeting were minimal. He says discussions about Paris have been limited to environment and agricultural sectors alone yet many sectors that contribute towards global warming could have made meaningful contributions. According to Zimbabwe’s Intended Nationally Determined Contributions (INDCs) that were presented last month to United Nations Framework Convention on Climate Change by the Environment, Water and Climate Change Minister, Oppah Muchinguri, the country is seeking to contribute to an ambitious goal of limiting temperature rise to below 1.5 degrees Celsius. INDCs are climate change mitigation actions, strategies or policies that result in the reductions of emission of greenhouses gases and the consequent slowing down of global warming. Muchinguri said Zimbabwe is looking at expanding and promoting the use of renewable and cleaner energy technologies.